Another wonderful recipe chock full of sticky, creamy, peanut butter goodness for this National Peanut Butter Day! These oatmeal cookie bars are chewy and delicious. And for a peanut butter lover, they deliver. Peanut butter throughout. The frosting is especially addicting. Line a 9×13 pan with wax paper. Cream vegan butter, peanut butter and sugars in a large bowl. Beat in egg. Add gluten free flour, baking soda, and oatmeal and mix until well combined. Press into an ungreased 9×13 pan. Bake for 12-15 minutes, or until the edges are golden brown. Remove from the oven and let cool completely before frosting. 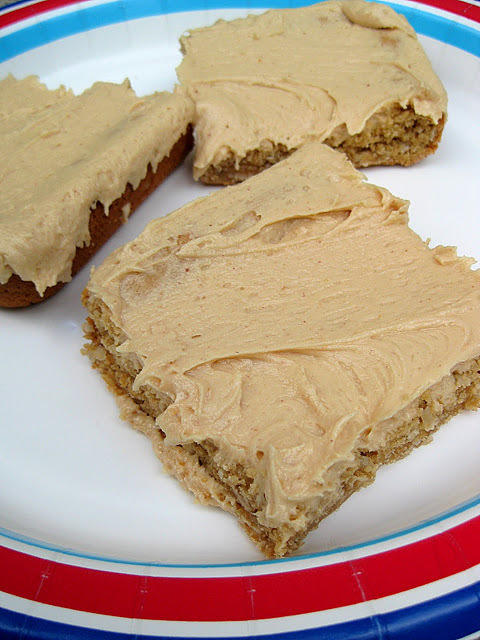 To make the frosting, combine the vegan butter, peanut butter, and vanilla in a medium sized bowl. Whip until light and fluffy. Start by adding 2 tablespoons coconut milk and the powdered sugar. Whip until incorporated. Adjust by adding more milk or more sugar until you reach the desired consistency. Spread ALL over your completely cooled blondies. Preheat oven to 350º F. Lightly grease an 8×8 inch baking pan. Sift together the gluten free flour, baking powder, kosher salt and baking soda.Set aside. In the bowl of a stand mixer with the paddle attachment (a handheld mixer works fine) mix together the light brown sugar, melted unsalted vegan butter and pure vanilla extract. Add in 1 large egg and mix to combine. Slowly add in the dry ingredients and mix until the ingredients are almost combined. Take a spatula and fold the ingredients together. Chop up 6 regular size peanut butter cups into 4 pieces each. 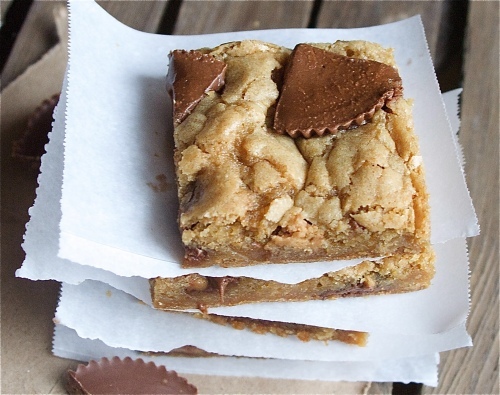 Throw the chopped peanut butter cups into the blondie batter and fold them in. Spread the batter evenly in the lightly greased baking pan. Bake for a total of 25 minutes at 350ºF. While the blondies are baking, chop up 3 more regular size peanut butter cups into 4 pieces each. During the last 5 minutes of baking, press the chopped up peanut butter cups into the blondies. Then continue baking the blondies for 5 more minutes, the baking time will total 25 minutes. 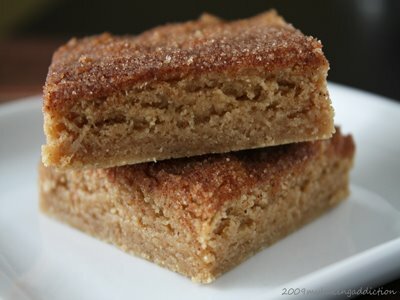 Once the blondies are done baking, cool completely on a cooling rack and then cut into squares. Kwegyirba Croffie is a freelance Associate Producer at News 12 Connecticut and a Special Events/Event Planning and Social Media Intern at College Lifestyles (TM). She is a Quinnipiac University alumni and a sister of Alpha Delta Pi. She enjoy cupcakes, Broadway musicals, Forever 21 ,giraffes, peacock feathers, orchids, lillies and anything Disney. So grab your wand and let’s bake up some magic. Incredibly buttery and over-the-top sweet, as I imagine the “real” butterbeer would be. Preheat the oven to 325 degrees and spray an 8×11″ baking dish with vegetable oil cooking spray (you can use a 9×13″ pan; just reduce the baking time by about 10 minutes or so). In a medium bowl, whisk together the gluten free flour, baking soda, and baking powder. In a large bowl, cream together the buttery spread and brown sugar and granulated sugar until smooth. Add in the egg and beat for one minute. Beat in the cream soda and vanilla, and then gradually beat in the dry ingredients just until combined. Slowly stir in the butterscotch chips. Spoon the batter into the prepared baking dish and spread evenly. Transfer the pan to a wire rack to cool completely before cutting into bars. Heat up the oven and break out the measuring cups! It’s time for another delicious installment of yummy. Blondies. Not quite brownies but definitely just as good. I remember my first blondie. It was sophomore year of cheerleading and before a game, one of the girls aunts (who are SO good at baking – they can bake up a storm!) made us blondies. No nuts or anything just blondies and they were delicious! 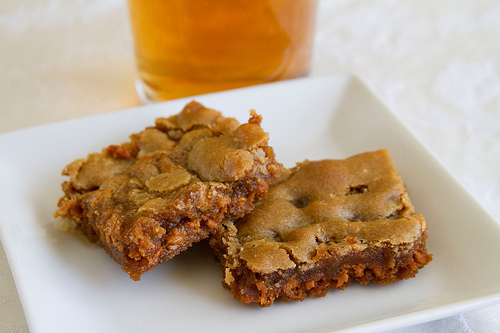 Every game, bake sale or competition we had, we always hoped blondies would be at the table for a quick sugar boost. They are sweet and delicious and worth trying if you haven’t tried them already. I have seen a few recipes that add nuts, chocolate chips or toffee bits to the batter before baking them so if you like, you can definitely add your favorite addition to kick these bars up a notch. (Make sure the addition is gluten-free 🙂 ) This is a very simple recipe that is definitely worth having around. Blondies...maybe better than brownies? You be the judge. Preheat oven to 360 degrees F.
In a mixing bowl, mix melted buttery spread and brown sugar on medium speed for 1 minute. Add eggs and vanilla. Continue mixing another minute or until mixture is light and fluffy. Add the rest of the dry ingredients and mix until combined. Spread batter into a greased 9×13 pan. Bake 33-38 minutes or until a toothpick inserted in the middle comes out clean. Cool slightly before cutting into bars.